For RAW shooters who use a 3rd party software tool such as Lightroom or Capture 1, the majority of these camera settings are completely ignored! Wait… what?! The in-camera settings in DSLRs allow you to use your camera as a processing lab. This is critical when capturing JPEGs, because the whole idea is to produce an image that is fairly optimized straight from the camera. For photojournalists who are required to submit JPEGs, these settings matter because they aren’t given the opportunity to really do much (or any) post-processing on deadline. However, the vast majority of fine-art and other professional photographers shoot exclusively in RAW format, and most of them (myself included) use 3rd-party software to process our RAW images. That’s because the RAW file is far more flexible than a JPEG for handling extreme exposure and contrast adjustments; and 3rd-party software tends to offer a far greater range of tools and adjustment options than what the camera manufacturers provide for free. What settings get read by my RAW converter? If you use the software provided by the manufacturer, it will generally read and apply all of the as-shot settings from your camera. 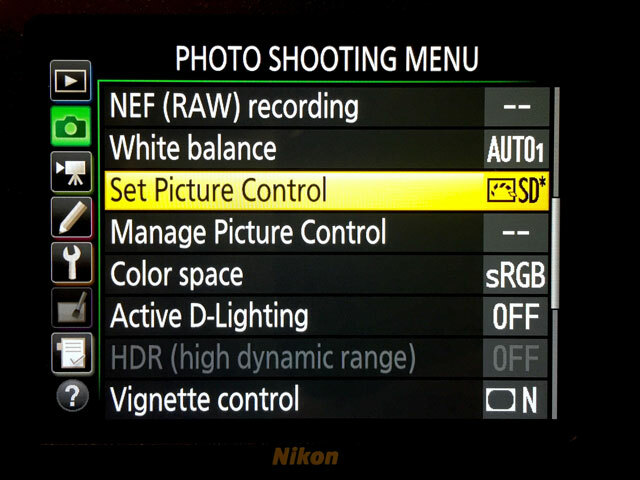 For Nikon users, this includes Picture Controls, distortion & vignetting, and noise reduction. The idea is that you could use the software to generate a JPEG from a RAW file that is identical to what the camera would produce, but of potentially higher quality. On the other hand, if you use ACR/Lightroom, Capture 1, or any other RAW conversion software, then the only setting that is read from your RAW file is White Balance. Yep, that’s it. You can set 3rd-party software to read the “as-shot” white balance but no other settings are read or applied when images are displayed. How should I set up my camera, then? Even though the as-shot settings aren’t applied by default in 3rd-party RAW converters, that doesn’t mean you should ignore them entirely. First of all, the in-camera settings are applied to the embedded preview JPEGs inside your RAW files. You see these JPEG previews when you review images on the back of your camera. Certain browsers, like Photo Mechanic, can display RAW files based on their embedded previews, too. In this sense, I prefer to set up my camera using Nikon’s “Standard” Picture Control setting for color and contrast. Doing so enables me to preview images with color and sharpness that is useful when I review images on the camera LCD. Some settings just don’t matter, though. You can turn off high-ISO noise reduction when shooting RAW; sometimes this will in turn result in a slightly faster frame rate or greater buffer capacity. That’s because the camera doesn’t have to process your image files as much during the initial capture. 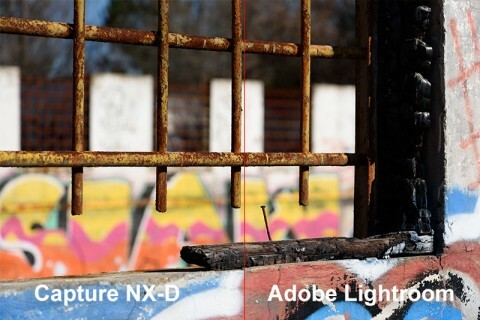 You can choose to disable lens corrections (distortion and vignetting), too and it won’t matter on your RAW captures. One setting that does affect RAW files is long exposure noise reduction. If you are capturing images with this feature turned on, dark noise (hot pixels) are removed during image capture and applied to the RAW file. I sometimes enable this option when capturing long night-time exposures. I often get asked about the Color Space setting, too. Again, it only applies to JPEGs and the embedded JPEG previews inside your RAW files, so go ahead and set it to sRGB to get better color on your camera LCD. The RAW file will be processed with whatever default color space you have in your software (with Lightroom, it’s ProPhoto RGB). What about my RAW software? Do I lose out by using a 3rd-party application? When set up properly, a Nikon RAW (NEF) image processed in Lightroom (right) is virtually indistinguishable from the same image processed in Nikon’s Capture NX-D (click to enlarge). Despite the fact that RAW converters such as Adobe Lightroom don’t read the majority of your in-camera settings, it doesn’t mean you can’t apply these corrections automatically on your own. One thing I like about Lightroom is that it emulates Nikon, Canon and Fuji picture settings (color & contrast) nearly perfectly. Lightroom and other software tools also offer built-in automatic lens corrections to fix distortion and vignetting; you just have to know how to enable it. Usually, these settings are not enabled by default, but you can modify your defaults to apply color, contrast, and lens corrections automatically to RAW images from any camera. Learn more about how to set up Lightroom to match your in-camera settings with my complete PDF guide, Moving to Lightroom. Previous PostOld Car City USA Creative Photo Workshop: Nov. 4-5Next PostCloud Stacking Video Tutorial Released! I came across your web site this morning via “Talking Bird Photography with Jason P. Odell – YouTube.” You have a lot of good and interesting information including this blog. Of course things change over time but I believe Lightroom and Photoshop now use the same ACR version. I think that LR and ACR are finally back in Sync!